Poverty in Galicia was extreme, particularly in the late 19th century. Galicia in that period has been described as not only the poorest province of Austro-Hungary, but the poorest province of Europe. The reasons included little interest in reform from the major landholders and the Austrian government, population growth resulting in small peasant plots, lack of education, primitive agricultural techniques, and a vicious circle of chronic malnutrition; famine; and disease, reducing productivity. Poverty in the province was so widespread that the term "Galician misery" (nędza galicyjska) or "Galician poverty" (bieda galicyjska) has become proverbial, and the poverty and regular famines in the region were often compared to the situation in British Ireland. Austria-Hungary failed to create transportation networks necessary for the development of industries and markets throughout the empire. Unlike imperial Germany, the Habsburgs were hostile toward the idea of building railway systems in the provinces, and remained fixated on their own metropolis. The whole of Austrian Bohemia was served by only one line throughout the 1860s. Emperor Francis opposed further construction "lest revolution might come into the country." Railways were owned privately in Austria-Hungary before 1881, and only gradually acquired by the state interest until the outbreak of World War One. Viennese banks – wrote Clive Trebilcock of Cambridge – were tapping the eastern grain-plains [of Galicia] in fully colonial style. The new state borders had cut Galicia off from many of its traditional trade routes and markets of the Polish sphere, resulting in stagnation of economic life and decline of Galician towns. Lviv lost its status as a significant trade center. After a short period of limited investments, the Austrian government started the fiscal exploitation of Galicia and drained the region of manpower through conscription to imperial army. The Austrians decided that Galicia should not develop industrially but remain an agricultural area that would serve as a supplier of food products and raw materials to other Habsburg provinces. New taxes were instituted, investments were discouraged, and cities and towns were neglected. Education lagged behind, with only 15% or so of the peasants attending any kind of school, meaning that few peasants had the skills to pursue other careers. Even if they did, no major Galician city (Kraków or Lwów) was a center of significant industry, which gave peasants little alternatives to their profession. The Austrian imperial government showed absolutely no interest in schooling and subsequent reform such as industrialization, which would upset the system in which Galicia was a cheap provider of agricultural products for the Empire, and a market for inferior industrial goods, a situation profitable for both the governments and the landowners. The Austrian government treated Galicia as a colony that could be treated to another country, and overtaxed it rather than invested in it. In what little industry Galicia had, one of the largest local branches (about a third of the total) was alcohol brewing, further exploiting and impoverishing the peasantry. Alcoholism was a major social problem. Agricultural productivity of Galician peasants was one of the lowest in Europe, due to the use of primitive agricultural techniques, many little different from those used in the Middle Ages. The situation in Northern (Polish) Galicia was compounded by the lack of good land and growing population, resulting in the steadily diminishing size of an individual peasant's plot. Over 70% of Galicia population lived off the land. In the second half of the 19th century, with only a marginal increase of arable land (about 7%), the population of peasants doubled. In 1899, 80% of the plots had less than 5 acres (2.0 ha), and many were not able to grow enough food on their plots to support their families. Overpopulation in Galicia has been so severe that it has been described as the most overpopulated place in Europe, and compared to India and China. Emancipation of serfs in 1848 did not improve their situation significantly, as they were given poorly paid jobs by the local major landowners (who owned 43% of the arable land in 1848), doing little to improve the peasants welfare from the previous feudal relations. Due to other changes in the law, peasants also lost access to many forests and pastures, which the large landowners tried to secure for themselves. As a result of Galician poverty, Galician peasants were too malnourished to work properly, and had little immunity to diseases such as cholera, typhus, smallpox and syphilis. Stauter-Halsted describes a vicious circle in which Galician peasants worked "lethargically because [they were] inadequately nourished and [not living] better because [they] work too little." Frank quotes Szepanowski: "every resident of Galicia does one-quarter of a man's work and eats one-half of a man's food." The near constant famines in Galicia, resulting in 50,000 deaths a year, have been described as endemic. Many peasants were heavily in debt, and had lost their land to the money-lenders. Most of those were Jewish; which led to resentment and growing anti-Semitism. 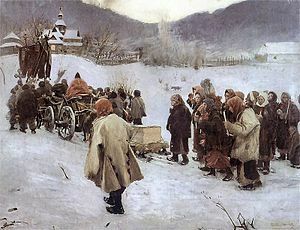 The misery of Galician peasants was highlighted by a number of activists such as Ivan Franko, and in several publications, such as Scarcity and Famine in Galicia by Roger Łubieński (1880). Stanisław Szczepanowski in 1888 published the still widely cited Galician Misery in Numbers and his phrase Galician misery or Galician poverty (nędza galicyjska or bieda galicyjska) became a proverbial description of Galicia, characterizing the depressed economy of the region. In response to the poverty and lack of reform, many peasants chose to emigrate. This process began in the 1870s with few thousand, then over 80,000 emigrated in the 1880s, about 340,000 in the 1890s, and an even greater number in the 1900s. Davies notes that from mid-1890s to 1914 (the start of World War I), at least two million people left Galicia, with at least 400,000 in 1913 alone. Harzig gives an estimate of 3 million. The years 1911–1914 might have seen the emigration of 25% of Galician population. Some emigration was local, to richer parts of Galicia and nearby Bukovina; others moved to Bohemia, Moravia, Silesia, or other provinces of Austria, Prussia and Russia (including Russian Poland). An increasing number emigrated to the United States (Herzig notes perhaps as many as 800,000 out of her 3 million estimate). Norman Davies noted that the situation in Galicia was likely more desperate than in Ireland, and that Galicia was likely "the poorest province in Europe". Galicia was indeed the poorest of the Austrian provinces and markedly poorer than western Europe. In 1890 the per capita product, in 2010 dollars, for Galicia was $1,947. In contrast, the per capita product in Austria was $3,005 and in Bohemia was $2,513. Galicia was not as poor as eastern Hungary, whose per capita product was $1,824 and Croatia-Slavonia, whose per capita product in 2010 dollars was $1,897. Galicia's per capita product was almost identical to that of Transylvania, which was $1,956 in 2010 dollars. Galicia's annual growth rate from 1870 to 1910 was 1.21 percent, slightly lower than the imperial average of 1.5%. In comparison to other countries, Galicia's 1890 per capita product of $1,947 in 2010 dollars was three times lower than that of the United Kingdom ($6,228) and lower than that of every country in northwestern Europe. However, it was higher than that of Portugal ($1,789), Bulgaria ($1,670), Greece ($1,550), Russia ($1,550), and Serbia ($1,295). a ^ Although as shown by the analysis of late 1840s deaths in Zadoks, many death estimates sum those from hunger and disease. For example, Bodnar attributes the deaths to "typhus following the potato famine". ^ David Crowley, National Style and Nation-state: Design in Poland from the Vernacular Revival to the International Style, Manchester University Press ND, 1992; ISBN 0-7190-3727-1 (Google Print) p.12. ^ Clive Trebilcock (2014). "Austria-Hungary". The Industrialisation of the Continental Powers 1780-1914. Routledge. pp. 349–350, 351–352. ISBN 1317872150. ^ Alison Fleig Frank (2005). Oil empire. Harvard University Press. p. 45. ISBN 978-0-674-03718-2. Retrieved 8 April 2013. ^ Keely Stauter-Halsted (28 February 2005). The Nation In The Village: The Genesis Of Peasant National Identity In Austrian Poland, 1848–1914. Cornell University Press. p. 24. ISBN 978-0-8014-8996-9. Retrieved 4 April 2013. ^ a b Alison Fleig Frank (2005). Oil empire. Harvard University Press. p. 47. ISBN 978-0-674-03718-2. Retrieved 8 April 2013. ^ a b c d John E. Bodnar (1973). The ethnic experience in Pennsylvania. Bucknell University Press. p. 45. ISBN 978-0-8387-1155-2. Retrieved 8 April 2013. ^ a b c Ivan L. Rudnytsky (1982). "The Ukrainians in Galicia Under Austrian Rule". In Andrei S. Markovits; Frank E. Sysyn. Nationalbuilding and the politics of nationalism: essays on Austrian Galicia. Harvard University Press. p. 52. ISBN 978-0-674-60312-7. Retrieved 8 April 2013. ^ a b c d e f g Norman Davies (24 February 2005). God's Playground A History of Poland: Volume II: 1795 to the Present. Oxford University Press. pp. 106–108. ISBN 978-0-19-925340-1. Retrieved 8 April 2013. ^ a b Richard Frucht (2005). Eastern Europe: an introduction to the people, lands, and culture. ABC-CLIO. p. 53. ISBN 978-1-57607-800-6. Retrieved 8 April 2013. ^ Rosa Lehmann (2001). Symbiosis and ambivalence: Poles and Jews in a small Galician town. Berghahn Books. pp. 33–. ISBN 978-1-57181-505-7. Retrieved 8 April 2013. ^ Kamil Kowalczyk; Grzegorz Moskal; Michał Rapta; Józef Szlaga (2012). Rabka Juliana Zubrzyckiego. Historia Rabki. p. 43. ISBN 978-83-931788-4-1. Retrieved 8 April 2013. ^ Keely Stauter-Halsted (28 February 2005). The Nation In The Village: The Genesis Of Peasant National Identity In Austrian Poland, 1848–1914. Cornell University Press. p. 27. ISBN 978-0-8014-8996-9. Retrieved 4 April 2013. ^ Keely Stauter-Halsted (28 February 2005). The Nation In The Village: The Genesis Of Peasant National Identity In Austrian Poland, 1848–1914. Cornell University Press. pp. 24–25. ISBN 978-0-8014-8996-9. Retrieved 4 April 2013. ^ a b c d Keely Stauter-Halsted (28 February 2005). The Nation In The Village: The Genesis Of Peasant National Identity In Austrian Poland, 1848–1914. Cornell University Press. p. 26. ISBN 978-0-8014-8996-9. Retrieved 4 April 2013. ^ a b c d Alison Fleig Frank (2005). Oil empire. Harvard University Press. pp. 43–44. ISBN 978-0-674-03718-2. Retrieved 8 April 2013. ^ a b c Norman Davies (31 May 2001). Heart of Europe:The Past in Poland's Present. Oxford University Press. pp. 331–. ISBN 978-0-19-164713-0. Retrieved 8 April 2013. ^ Keely Stauter-Halsted (28 February 2005). The Nation In The Village: The Genesis Of Peasant National Identity In Austrian Poland, 1848–1914. Cornell University Press. p. 2122. ISBN 978-0-8014-8996-9. Retrieved 4 April 2013. ^ Jaroslav Petryshyn (1 January 1985). Peasants in the Promised Land: Canada and the Ukrainians. James Lorimer & Company. p. 31. ISBN 978-0-88862-925-8. Retrieved 8 April 2013. ^ a b Larry Wolff (9 January 2012). The Idea of Galicia: History and Fantasy in Habsburg Political Culture. Stanford University Press. p. 256. ISBN 978-0-8047-7429-1. Retrieved 8 April 2013. ^ Mieczysław Czuma (1998). Austriackie gadanie czyli encyklopedia galicyjska. Oficyna Wydawniczo-Handlowa Anabasis. p. 145. ISBN 978-83-85931-06-5. Retrieved 8 April 2013. ^ Robert Allen Rothstein (31 December 2008). Two words to the wise: reflections on Polish language, literature, and folklore. Slavica Publishers. p. 185. ISBN 978-0-89357-361-4. Retrieved 8 April 2013. ^ Larry Wolff (9 January 2012). The Idea of Galicia: History and Fantasy in Habsburg Political Culture. Stanford University Press. p. 289. ISBN 978-0-8047-7429-1. Retrieved 8 April 2013. ^ a b c d John E. Bodnar (1973). The ethnic experience in Pennsylvania. Bucknell University Press. p. 48. ISBN 978-0-8387-1155-2. Retrieved 8 April 2013. ^ a b Christiane Harzig (1997). Peasant Maids, City Women: From the European Countryside to Urban America. Cornell University Press. p. 9. ISBN 978-0-8014-8395-0. Retrieved 8 April 2013. ^ Jan C. Zadoks (15 October 2008). On the Political Economy of Plant Disease Epidemics: Capita Selecta in Historical Epidemiology. Wageningen Academic Pub. p. 102. ISBN 978-90-8686-086-9. Retrieved 8 April 2013. This page was last edited on 5 February 2019, at 22:10 (UTC).